The 5th week marks the halfway point of the 2019 Legislative Session and the start of Child Abuse Prevention Month. This week pinwheels popped up around the Capital City and throughout the state to raise awareness for child abuse prevention and support Great Childhoods for all children. This week the Capitol also hosted the Lauren's Kids '42 Hours for the 42 Million' awareness event led by Senator Lauren Book. 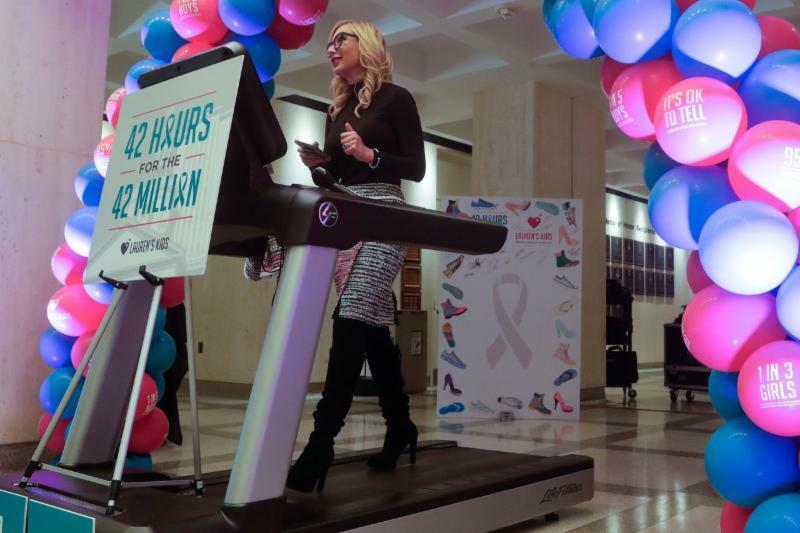 Volunteers from across the state including Legislators, Agency Secretaries, community leaders and many more walked on a treadmill in the Florida Capitol for 42 consecutive hours to raise awareness and support for the 42 million sexual abuse survivors. 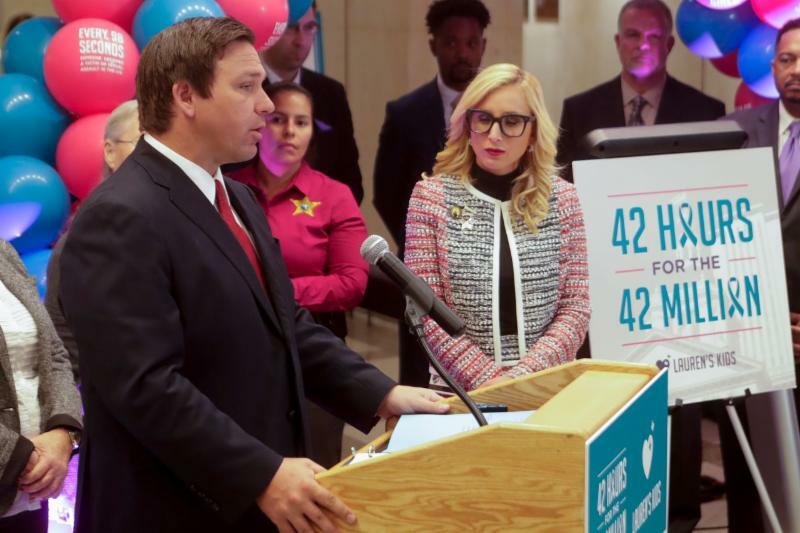 Additionally, the DeSantis administration made a few big announcements this week. At the Governor's press conference celebrating Child Abuse Prevention month, he announced the appointment of First Lady Casey DeSantis as Chair of the Florida Children and Youth Cabinet. 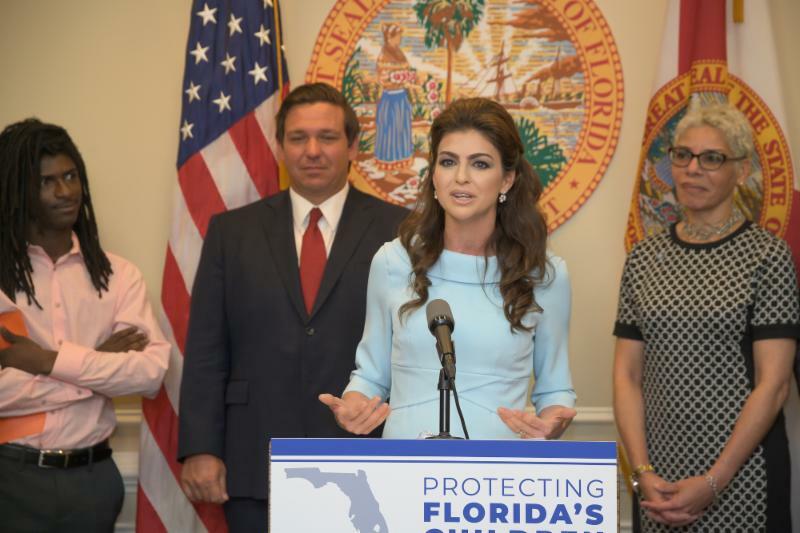 In response to her appointment, First Lady Case DeSantis said, "I'm honored to serve the people of Florida in this capacity and look forward to working with child advocates across the state to better the lives of some of the most vulnerable citizens of our society." 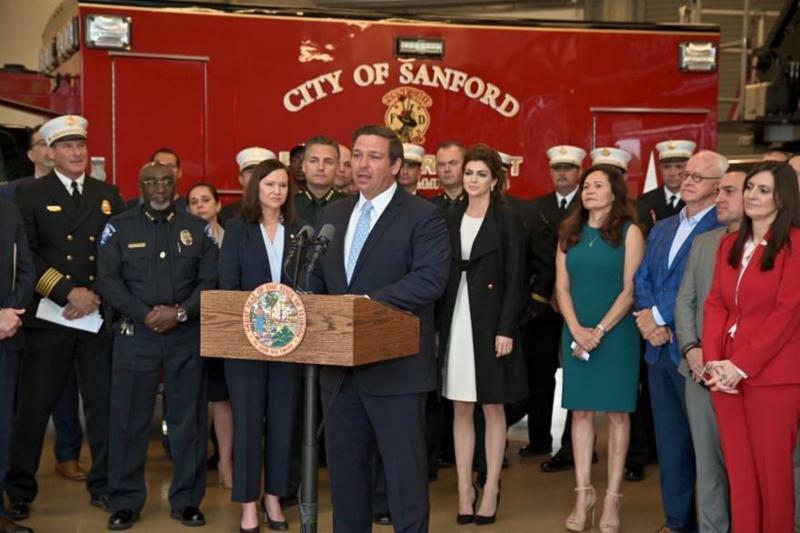 The second announcement made by Governor DeSantis was that Florida has been awarded $26 million of federal dollars to fund a State Opioid Response Project aiming to reduce opioid-related deaths, prevent opioid abuse among young people and increase access to recovery treatment and services. He also announced the re-establishment of the Office of Drug Control within the Executive Office of the Governor and a Statewide Task Force on Opioid Drug Abuse. DCF Secretary Chad Poppell stated, "Too often children come into care because of their parent's opioid use. This $26 million, along with the significant investments already being made, will further Florida's ability to provide treatment, expand hospital bride programs, and enhance coordination within the child welfare system to help the parents of vulnerable children." ﻿These similar bills authorize the court to receive & consider information provided by the Guardian ad Litem Program & child's attorney ad litem if the child is under jurisdiction of dependency court, add requirements related to transferring dependent children from DJJ facilities & grant additional authorizations to the GAL Program. These similar bills establish standards for instruction of circuit and county court judges who have responsibility for dependency cases regarding the recognition and treatment of head trauma and brain injury in a child from birth to five years of age. The bills additionally require the establishment of a communication process between DCF and law enforcement and creates a pilot for three lead agencies to develop and implement a program to more effectively provide case management to children under six years of age. These bills are known as "Jordan's Law" and aims to prevent tragedies like Jordan Belliveau's death. These similar bills create the Foster Children's Bill of Rights, require the Florida Children's Ombudsman to serve within DCF to provide children in out-of-home care with a means to resolve issues related to their care, services or placement, and require caseworkers to provide caregivers with information regarding child care subsidies. These similar bills aim to protect the welfare of minor children by providing for transitions of custody that consider each child’s developmental stage and psychological needs. These similar bills come from recommendations of DCF staff as part of the Paths Forward Initiative to mitigate the loss of the IV-E waiver and to prepare for the implementation of the Families First Act. It includes new requirements for DCF placing a child in shelter care, changes to the Guardian Assistance Program and requirements for young adults in foster care. These similar bills aim to speed up the dependency process for children removed from their home to achieve permanency within 1 year. Permanency can be reunification with parents, placement with a permanent guardian, often a relative, or adoption. The bills make changes such as requiring updated parent contact information, making referrals to services for parents within 7 days, requiring parents to notify the court of any barriers to completing their case plan, and to clearly inform parents that if they do. This bill revises communication requirements for all parties involved in child welfare case plans and revises additional case plan requirements. A strike-all amendment on HB 69 was adopted this week changing substantive portions of the bill. The bill now requires child care facilities to enact procedures to ensure children are not left in vehicles used by the facilities including but not limited to transportation logs, physical/visual sweeps, and/or alarm systems. The bill also provides for the emergency suspension of a child care facility if a child dies as a result of being left in the facility's vehicle. SB 94 has not been amended and still requires all vehicles used by child care facilities to transport children be equipped with reliable alarm system that prompts driver to inspect vehicle for children before exiting. These identical bills create a coordinated assessment system that allows for the tracking the progress of students from VPK through grade 2, include assessments of children and teacher-child interactions and require the Office of Early Learning to adopt a minimum program score for the purpose of determining program effectiveness. These similar bills rename Competency-Based Education Pilot Program as the Mastery-Based Education Pilot Program and allow local school districts to participate in an Alternative Credit and Letter Grade Systems for middle and high schools . These similar bills require all instructional materials for school civics education courses be reviewed by the Joint Center for Citizenship and approved by the Commissioner of Education. These bills are no longer identical as HB 259 has been amended to remove the provisions related to the Human Trafficking Activity Hotline and human trafficking awareness campaigns. SB 982 has not been amended and both bills still require health education in public schools to include information on the warning signs of human trafficking and authorize a student opt-out option. This proposed legislation establishes a back-to-school sales tax holiday from Aug. 2, 2019 - Aug. 11, 2019 which exempts purchases of clothing, school supplies, personal computers and computer accessories under a certain dollar amount from sales tax. These identical bills revise criteria allowing a person who committed a felony to be sentenced as a youthful offender if the crime was committed before the defendant turned 21. These bills increase the age to lawfully possess tobacco products, including electronic smoking devices, from 18 to 21 years of age; however these bills are no longer similar. SB 1618 was amended to exclude cigars from the list of tobacco products for which the minimum possession age would be moved to 21. The bills also decriminalize the penalty for any person who sells, delivers, or gives tobacco products to a person under age 21 and requires a fine instead of criminal penalties. Exempts the sale of diapers and incontinence undergarments from sales tax. These similar bills require a health insurance policy that provides coverage on an expense-incurred basis for a family member of the insured to provide coverage for children birth to 21 for hearing aids prescribed, fitted and dispensed by a licensed audiologist and establishes the minimum coverage amount of $3,500 per ear within a 24 month period. Click here to subscribe to the Capitol Connection and ensure you receive these weekly updates.